Midnight Delights? ~ Look Up! The Fourth of July is linked to the brightest star in the heavens, Sirius. Every year on July 4 from our Earth's position, our Sun is in conjunction with Sirius. Esoterically this star is our Spiritual Sun and is associated with liberation. According to ancient teachings, the concept of freedom resides in human consciousness because of the influence of this star system. Astrologically, a conjunction is the strongest aspect celestial bodies can have. Our Sun exactly conjoins Sirius in the sign of Cancer at 14 degrees, which occurs around July 4–7. America's Independence Day is strongly linked to the conjunction of Sirius and our Sun! Note: Interestingly enough Canada Day, July 1, marks Canada's independence from England. Bastille Day, the French Independence Day, is July 14. And the transfer of sovereignty in Iraq occurred with a surprise handover (2 days early) on June 28, 2004. BTW: Another fascinating note is that the Dalai Lama, His Holiness Tenzin Gyatso, was born July 6, 1935 and George W. Bush, the 43rd President of the United States, was born July 6, 1946. Both men in their own unique way have been dedicated to increasing freedom in our world. How Many Celestial Bodies Will You See? The curved yellow line at the bottom of the image represents the eastern horizon. The Sun rises about 6:00am and sets around 8:30pm. Al Hecka and Elnath by 7:30pm. Note: These celestial bodies dance invisibly across the sky during the daylight hours. Their energies influence our daytime activities. Every year on July 4 Taurus the Bull heralds the rising Sun. The enlightened mind is the gift of Taurus when one transforms desire into spiritual aspiration. The sparkling Pleiades, the famous star cluster marking the shoulder of Taurus the Bull, rises around 2:40am. It is said that the Pleiades transmit the Light of God (the Universal Mind) into our minds, enabling God's light to descend on Earth. Aldebaran, truly the "Bull’s eye" star of enlightenment, holds a vision that is seeded by the Pleiades. It is a divine ideal that can aid humanity’s evolutionary process through its political systems. The horns of the Bull embody struggles that are age-old and evolutionary. The southern horn and its star, Al Hecka, symbolize stalemates, standoffs and blind habitual fighting, while the northern horn and its star Elnath represent perseverance and breakthroughs. Today, with the multitude of global and personal struggles, we experience desires and spiritual aspirations tugging and pulling at us. Humanity often hangs on the horns of a dilemma having to make a difficult choice. BTW: Elnath, the tip of the northern (upper) horn of Taurus the Bull, is also a southern star in the constellation Auriga. This star lies almost opposite our galactic center. When we look at Elnath we are looking toward the rim of our galaxy and the less-populated regions of intergalactic space, away from the crowded galactic hub. Again, tune to Elnath for perseverance and breakthroughs. Allow Elnath to expand your horizons, free you from limiting influences and align you with the heart of our galaxy and its blessings. Did you check to see if there were any planets in the predawn sky of the Fourth of July? (See links under the sunrise map.) If so, you may want to learn about each planet as well as the significance of each planet positioned in a sign / constellation. See The Planets in Esoteric Astrology ... Scroll 1/2 way down page. Though you may not see any planets during the daylight hours, know that their loving emanations are shining down upon everyone all day long. Open to their gifts that set us free. Set yourself free! Look Up! Open to the illuminating and evolutionary light of this brand new day. Allow it to enlighten you and thereby descend on Earth. Expect inner fireworks as you liberate yourself from the energies that no longer serve the soul and the greatest good. Imagine others doing the same, each freeing their spirit by moving beyond judgment, hatred, and separation toward understanding, wise love and unity. Ponder freedom, independence and interdependence. BTW: The Fourth of July occurs during the sign of Cancer whose keynote is "Love builds a Lighted House wherein Life dwells." Each Fourth of July a Circle of Peace occurs at the Rainbow Gathering. A silent circle of people prays for world peace starting at sunrise and ending around Rainbow noon after a period of OHMing. Join this meditation on the inner planes wherever you are physically located. ... on the Fourth of July at 8:30pm. 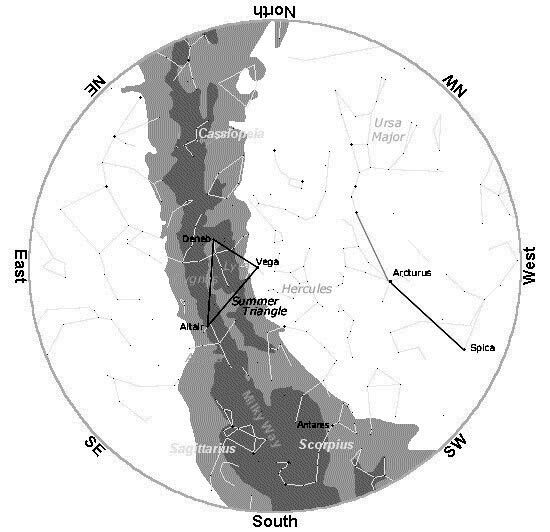 Find a clear unobstructed western horizon to really appreciate the view shown in the star map below. Use binoculars to improve visibility; do not view the Sun with them! Every year on July 4, the Sun representing physical consciousness, will, power and life-giving force, lies in the constellation of the Gemini Twins. From here its emanations harmonize will and form. The Gemini Twins though opposites representing the form and spirit, innately cooperate for the benefit of the whole. The emanations of Gemini keep the interplay of energies between dualities active and flowing so that eventually they reach synthesis and unity. Every Fourth of July impressive Leo the Lion lies above the sunset horizon until it sets around 11:00pm. A backward question mark of stars curves up from Regulus, Leo's brightest star and heart star, representing the Lion's chest, majestic mane and head. A triangle of stars forms Leo's hindquarters. Review map above. In Review ... Humanity's concept of freedom and liberation is linked to Sirius. The Fourth of July is linked to the conjunction of our physical Sun, the center of our solar system, and our spiritual Sun, Sirius. Regulus, the heart star of Leo the Lion, focuses and regulates the emanations of Sirius toward Earth. The constellation Virgo the Virgin with its brightest star, Spica, lies above (east of) Leo the Lion. Virgo's emanations nurture the essential divinity within humanity until spiritual birth can occur. This spark of divinity in each and every one of us can be fanned into the flame of Divine freedom as we tread The Path. Spying Spica ... Locate the Big Dipper a little northwest of overhead, arc from its handle to the bright golden star Arcturus directly overhead, and from there spike down to the south, to bluish Spica. Binoculars magnify their subtle hues. This helpful image helps one navigate the heavens. 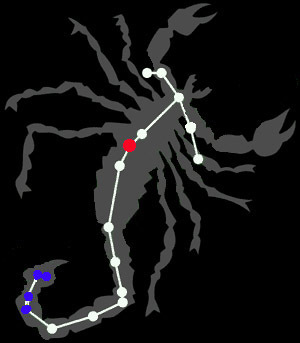 After taking in the sunset view, be sure to turn around to see the j-shaped cosmic Scorpion, Scorpius, fully risen in the southeast. Look for the Scorpion's reddish heart star, Antares. Binoculars magnify the subtle hue. The heavenly Scorpion travels west above the southern horizon all night long. Antares and Scorpius are initiatory and demand transformation. These potent celestial powers enliven the evolutionary burning ground within humanity. Be the Phoenix who rises to newfound spiritual freedom. More Fireworks by Popular Demand! ... are over, around 10:00pm, look west. Are you able to see blue-white Regulus, the heart star of Leo the Lion? How about bluish Spica above the cosmic Lion? Review map above. 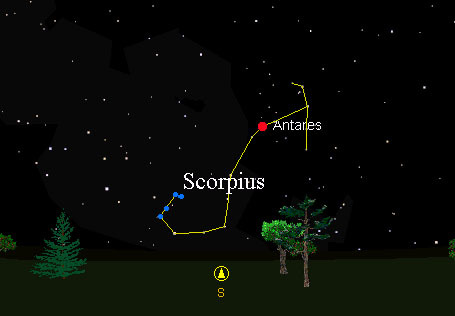 Turn south to see reddish Antares, the cosmic Scorpion's heart star. Helpful Map Now is a good time to view all these colorful celestial bodies with binoculars and to Navigate with the Big Dipper. Notice the seasonal position of the Big Dipper's bowl. Note: Moonlight can interfere with seeing colorful stars and planets. Also it's best to check out the Milky Way before the light of the moon enters the sky! See map and discussion below. Each year at this time the Milky Way magnificently sweeps through the heavens from the southern horizon to the northern horizon. The best way to view it is away from city lights, in a dark sky without moonlight. Look again, any summer night for the Milky Way, when the sky provides a dark view. Look Up! The celestial gems and jewels are beckoning you to call out their names. Weather permitting in a dark sky, just above the southern horizon you should be able to see two great summer constellations, Scorpius (sprawling "j" shaped), and Sagittarius (teapot shaped). Here the Milky Way bulges with the Heart of our Galaxy lying between these two great constellations. Antares, the heart of Scorpius, is a bright reddish star. Binoculars magnify the subtle hue. Be sure to review the image above. 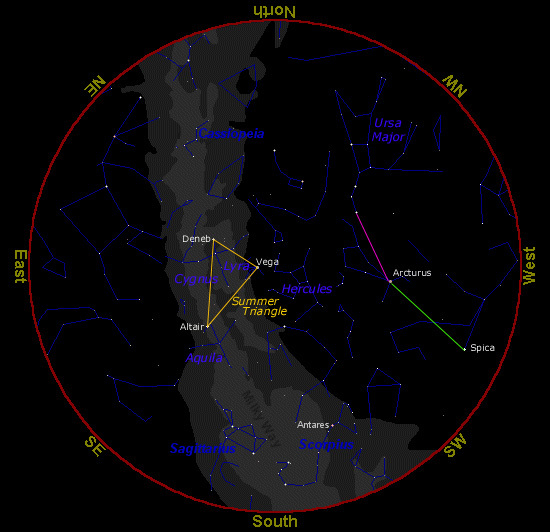 The Summer Triangle is centrally positioned over the Milky Way and Cassiopeia (M or W shaped) marks its northern sweep. Arc from the handle of the Big Dipper to golden Arcturus from there spike down to bluish Spica. Binoculars magnify their subtle hues. Note: Hercules the Strong Man lies about a third of the way from Vega to Arcturus. Look for his four star wedge-shaped torso. Enjoy your summertime night sky traveling! Vary the date and time of this Mid-Northern Latitude Sky Chart to see whether any bright planet or the moon is in the midnight sky (Hour: 00 Minute: 00). A portion of our own Milky Way Galaxy appears like a faint cloud extending from the southern horizon, high overhead, and onward to the northern horizon. This is an especially breathtaking sight, if you are away from bright city lights. It has been said this is the river of souls, the white ether, the plane of consciousness where all souls can hold communion with the Cosmic Christ. Wowsers ... Look Up! Liberate yourself and travel the Milky Way! Have a Safe and Sacred Fourth of July.